Welcome! Thank you for purchasing the Just TAP Absolute Beginner Course. Whether you’re just getting started, or you’ve finished the course, the list will hopefully contain the answers to the questions that are on your mind. No. Not yet. If you’d like to make the investment now, then go for it! But for the moment, just wear the hardest soled shoes you’ve got. Is the course relevant for all countries? Yes. Absolutely. There may be some instances where steps are done slightly differently based on geographic area, but the fundamentals of tap dance are all the same, wherever you go. It of course depends on how much time you’re initially able to dedicate to the material, and to practicing (you can cover the course in less than 1 day if you’re really feeling adventurous), but I would recommend taking 7 days to work through the content, practicing 30 minutes or more each day. Do I need to practice? How much? Yes. I recommend practicing 30 minutes or more each day. You’ll get out what you put in. It’s a cliché, but for a good reason. Fortunately, tap dance is so much fun that practice becomes pretty easy to do. Woo hoo! You’re done! We hope you’ve enjoyed the course, and are feeling confident and excited to keep exploring the exciting world of tap dance. Now that you’ve covered the basics, it’s time to keep building your skills. It’s time to locate your local tap dance community and join in with a tap class. Where do I find a tap class? Finding a tap class becomes a very easy task when you have found your tap community. There are lots of great tap classes all over the world, and a loyal, active tap dance community to go with it. Tap dance seems to attract welcoming, lovely people of all ages. 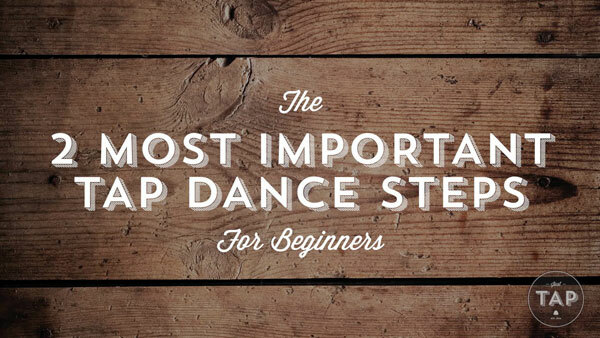 However, while there are tens of thousands of keen tappers the world over (and lots of classes and performance opportunities to go with it), in most places, tap is generally considered a niche art-form (when compared with Ballet or Hip-Hop for example), and as a result, the tap dance community may take a little research to locate. But rest assured…your tap dance community is there. …or for at least finding some more information & help. Google (Search: tap classes [insert area] or tap lessons [insert area]). Facebook groups. It’s possible there might already be one or more Facebook groups for tap dancers in your area. For instance, this is the ‘TAP IN BRISBANE’ group I started, which has over 100 members. If you can’t find a local group, there is also a number of national or world-wide groups (‘TAP DANCERS AROUND THE WORLD’ There may be are a great way to put the word out…many people will know of great classes in your area, or will be able to help point you in the direction of someone who can help. … you could even start your own group! Local dance schools. Your local dance schools may offer some great adult-oriented tap dance classes, but if not, they will likely know of some places you can go, or people you can contact. Tap Dance authorities and foundations (for instance, American Tap Dance Foundation). Check out their ‘Links’ page for a truckload of great resources. Tap Dance Festivals. There are heaps of tap dance festivals all over the world, who are very much in the know about all things tap dance. Reach out and get in touch! There’s a list of tap festivals on this page from American Tap Dance Foundation, but a quick google search will reveal plenty more. Should I invest in tap shoes? What sort of tap shoes should I get? A fantastic shoe, worn by both men and women. Comfortable, durable and well priced. I’ve loved my ‘RESPECTS’, and have happily recommended them a lot over the years. A perfect starter shoe, that will last. I love this shoe. Love it. I’ve been wearing ‘J-SAMS’ for over 5 years now, and love the built up sole, the comfort and style, and the deep sound these shoes can pull from a wooden floor. They’re a heavier than the ‘RESPECT’, but this is exactly what I personally look for in a tap shoe. A great, very well priced option for Intermediate, Advanced or Pro tappers. Ladies, feel free to wear a traditional heeled tap shoe. Some ladies prefer these, and some prefer the unisex black leather option. It’s all personal preference and either way is totally fine. Where do I get tap shoes from? There are lots of great online retailers, but most dance stores will stock tap shoes (Bloch & Capezio are the most common dance shoe brands, stocked in dance shops all over the world). What sort of music is good to tap dance to? There is so much great music to tap to; you can tap dance to anything with a beat. Swing music (Benny Goodman, Glenn Miller are some of my favorites) is magical to tap to. But I like getting very creative with my music choices. I recently performed the classical piece ‘Bolero’ by Ravel, which was an incredibly fulfilling routine. One of my all time favorite tap songs: ‘Swing Set’ by Jurassic 5. Put on some music, and have a tap! I want to perform. What should I do? Awesome! Good for you. It’s so much fun, and incredibly rewarding to perform tap dance to a live audience. Many classes will have fun performance opportunities available for their students. Or, why not start a small group for fun? Of course, if you’re wishing to one day take the next step and move into a professional capacity, or perhaps you’d like to teach the art of tap dance, then the most important thing is to keep tapping. Don’t stop. Stay inspired. Watch videos. Learn from every teacher you can. 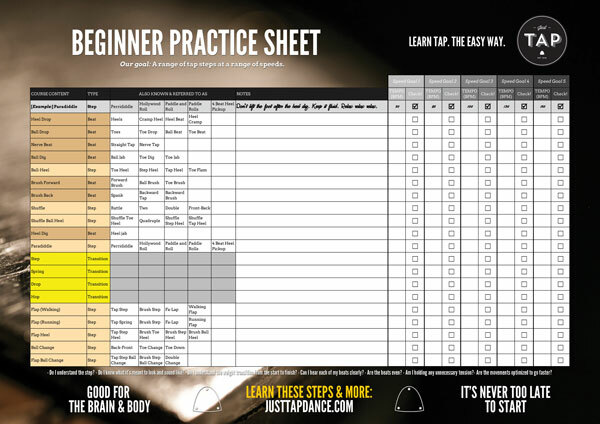 Begin creating tap choreography of your own. Keep building your technique and your ‘TAP TOOLBOX’ of steps and combinations and constantly strive to find your own style. It’s been my pleasure creating the ‘Just TAP’ course. I truly hope it helps you discover the magic of tap dance. Wherever the journey takes you from here, I wish you all the very best.